After having a look at your online visibility, it is now time for your offline visibility. There are several ways to let people, usually locally, but with internet possibilities of course also globally, get to know you and/or your business by you actually being there. It might happen that you are asked to give a presentation about your expertise or your business. If this happens you want to be prepared! By organising an event yourself, you can take matters into your own hands. In those cases, the essentials of networking, unforgettable presentations and event organising are of huge importance. 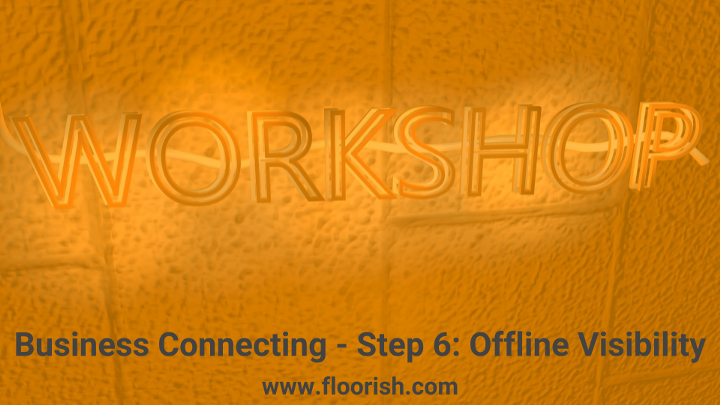 The following 6 aspects can make your networking experiences a lot easier! I love bringing people together and have been doing this since I started studying. I have organised many events and get-togethers for local and global large and small groups of people. This taught me a lot about what is needed to create a good space for discussing certain topics or doing certain activities that are related to the intention of the event. When I was 23, right after having my law degree, I worked at a communication firm in an in-between job and had my first-time experience with organising a large event for hundreds of people. The last event which I organised, from scratch on, was an international event in Berlin for about 60 people. At that time, after all my learning experiences, I was more conscious of what was needed. For me, the best learning is still by doing. Giving a presentation is another story for me. I still tend to avoid being in front of groups for giving a presentation. My experience is though that as long as I stay close to what I believe in and my gained knowledge so far, it all works out fine. Furthermore, some breathing exercises beforehand are helpful to ease the nerves. The best presentation I gave has been the one when I left an orphanage where I worked for in Nepal. I had to give a farewell speech to the children, teachers and the medical staff. The words just came like I was in a flow. Just looking at the children that were so dear to me, made me speak right from my heart. Of course it is not common to speak to such a specific audience, but still, it made me realize the importance of sharing a story right from your heart.